Welcome to he BEAUTIFUL High Desert! 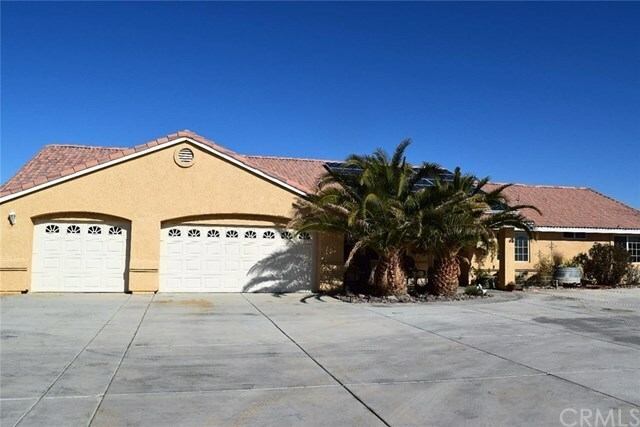 This stunning home is located in a beautiful area of Apple Valley. Wow - this home has all the bells and whistles! PAID solar system, PAID water softener, reverse osmosis system, mammoth sized custom carport and much more! Upon entry you are greeted with a nice sized formal living room! You will love the cozy family room featuring a wood burning stove and high ceilings! Oversized, open kitchen w/ gorgeous granite, tons of counter/stoarge space, breakfast bar & walk in pantry! Just off that is a sunny breakfast nook! Two nice sized guest bedrooms w/ ceiling fans. Spacious master with plant shelves, high ceilings & backyard access. Master bath has double sinks, step in shower & lovely tub! The backyard is AWESOME featuring gorgeous mountain views, large covered patio, permitted shed/shop (approx 12x20) and a C Train 40 foot storage shed (permitted)! Alarm system, swamp cooler, RV 220 hook up and RV sewer drain, 3 car garage, TONS of front concrete and much, much more - original owners have taken pride in this home and it shows! Take a look today! Directions: Up the 15 Fwy Cajon Pass to Bear Valley Rd to Central go North to Pah-Ute go East to Mesquite - go North to Little Beaver go East - 3 houses up on left hand side is Tate Ct go left home on right hand side.